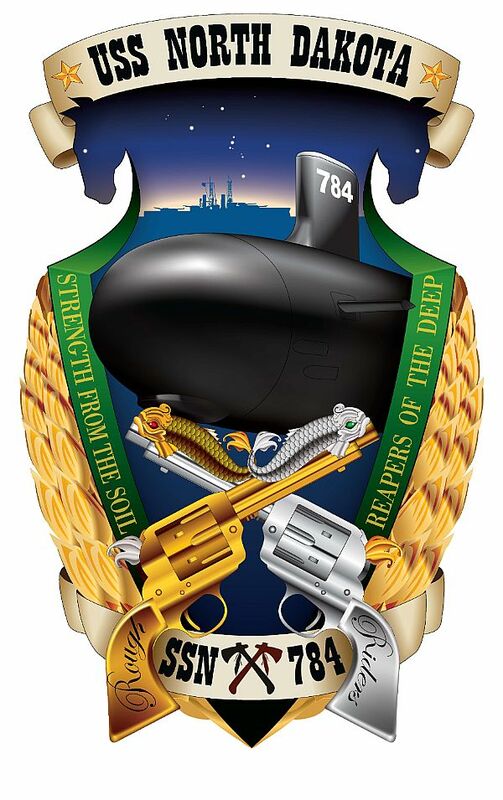 Tomorrow — Jan. 11 — will be “USS North Dakota Day” in North Dakota, of all places, as the state honors the attack sub that will bear its name come 2014. Cmdr. Doug Gordon, commander of the precommissioning unit North Dakota, is in the state to participate in a three-day-long series of events meant to tell North Dakotans what the ship named for their state can do. He’ll also brief state legislators on the construction process, according to a Navy news release. In addition … OK, just admit it — you’ve been staring at the crest this entire time. Two six-shooters (one silver, one gold) and two tomahawks, symbolizing the sub’s two canisters of six Tomahawk missiles, according to this Navy release. An image of the battleship North Dakota, the first ship named for the state, commissioned in 1910. Like the design? Or is it too much? Let us know in the comments below, or hit us up on Facebook. Great design. I love it.